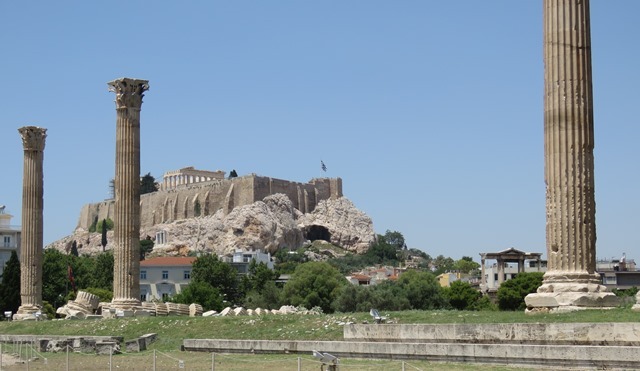 AMAZING ATHENS: SO MUCH TO SEE, SO MANY TO DRINK… SUCH A SHORT WEEK. You are here: Home / Just Go / AMAZING ATHENS: SO MUCH TO SEE, SO MANY TO DRINK… SUCH A SHORT WEEK. 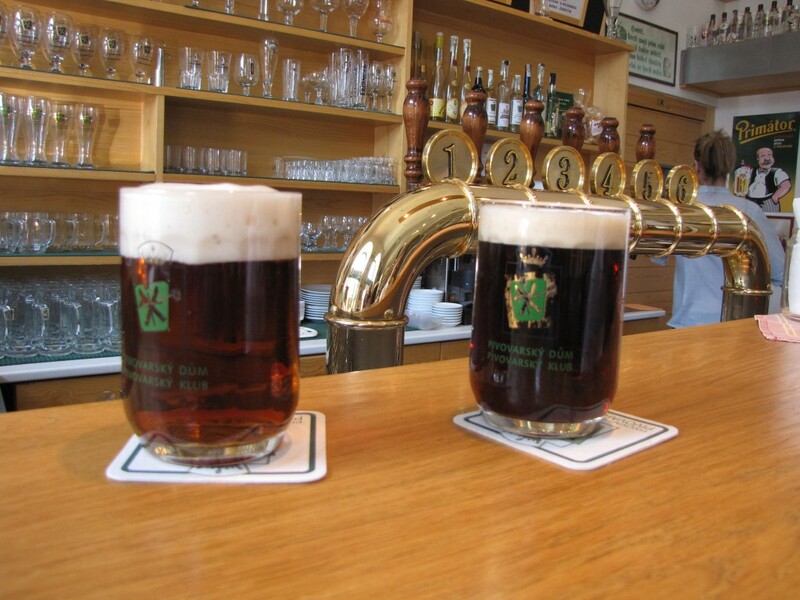 It’s easy to get into a rut when chasing great beers in Europe. England, Belgium, Germany, Scandinavia and, increasingly Italy and Iberia beckon with bountiful brews from skillful and dedicated brewers. Greece, we thought, might be a stretch. 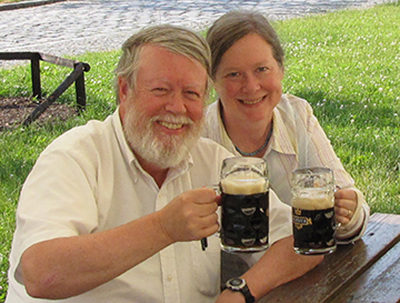 The last time we were in Greece–long before the European Union changed so much—the law forbid imported beers. Under the circumstances the Greek-brewed Amstel tasted pretty good – an ordinary Fix was the only easily available alternative. Oh how the world has changed since then. It’s still not Italy, which is pushing a thousand breweries, but we count over 60 breweries and the number continues to grow. 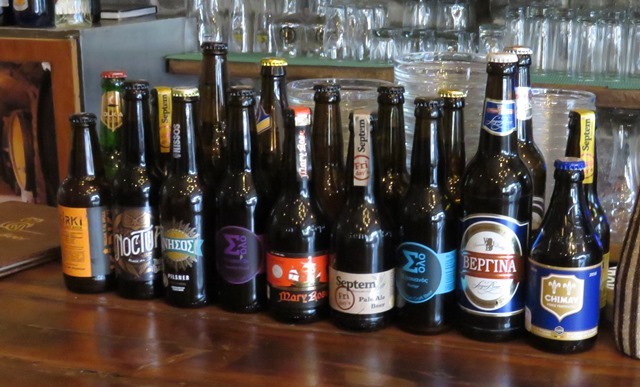 The impressive range of local beers mingles with a healthy range of imports. The EU busted open the floodgates and it’s easy to find German and Belgian classic beers in bars that treat them well. We’ll have a few posts on Athens during the year as we sort through material for our next book dealing with great beer near great sights in Europe. Today’s post is just a start. Staying: Airbnb has some great Athens options, including a slew of attractive places smack in the center of almost everything. We booked really late – the only hotel options were either way out of town or way out of our price range ($400 to $600 a night). Airbnb set us up with an apartment that overlooked the Temple of Olympian Zeus for about $75 a night. Four different markets were within a ten minute walk, including one virtually at the apartment door, to provide superb breakfasts at a bargain price. Arriving: The cab ride from the airport is a flat fee, 35 Euros this summer. To take Metro, you have to buy a special ticket that’s pricier than a regular fare. Trains leave every half hour. If you have a rail pass you can save a few Euros but taking the train toward the city and transferring to the metro at Holandri. You’ll pay regular in-city rates from there. There’s also a bus that takes you to Syntagma, Parliament square. Orientation. Athens is one of the most walkable of the European capitals, but you’ll save yourself blisters by buying a multi-day metro pass. The passes are good for 24 hours, so it’s worth considering a series of single passes since you’re not paying for the time between the expiration of the first and the validation of the other. Plaka is at the base of the Parthenon. 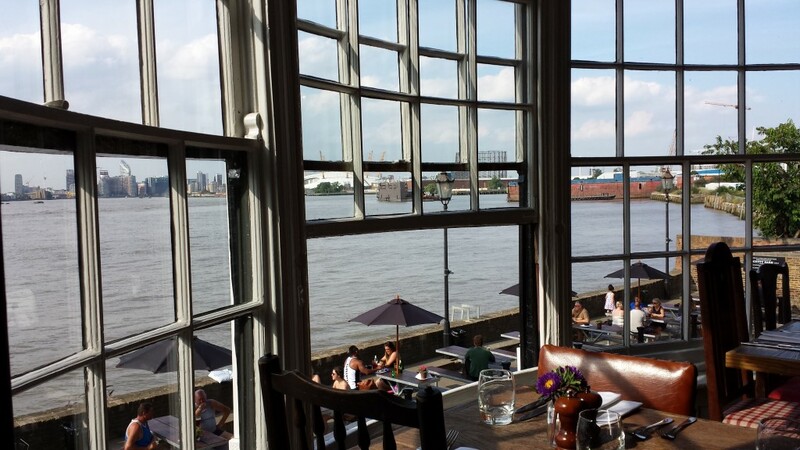 It’s touristy and crowded, but old and fun, and if you choose even moderately wisely, you can eat and drink well here. Syntagma is an uphill hike, Monastiraki is a bit farther out, but still within easy view of the Acropolis. 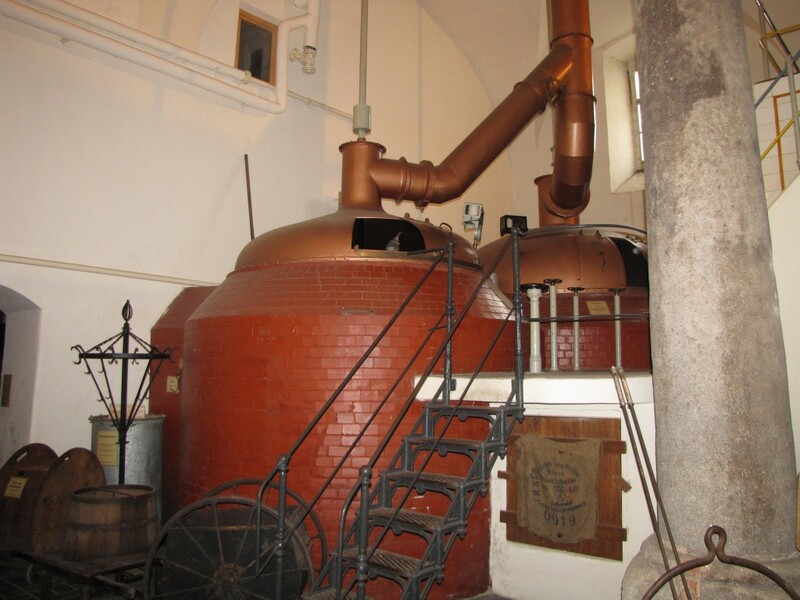 Some of the best beer is much farther out – in Halandri. It’s worth the adventure to go there if you there for more than a couple of days, but otherwise you’ll be drinking downtown and still drinking well. The Acropolis is only a part of what it once was, due primarily to Turkish cannons and British Thieves (they called themselves archeologists). What’s left is still simply stunning. There are two routes in. We recommend entering by the gate closest to the Acropolis museum, taking the long hike up and then descending on the other side close to the old Greek and more “modern” Roman agoras. The current Acropolis museum sits below the hill. Opened in 2009 it’s a history course in a box. You can spend forever looking at the details or get a perfectly good overview in a couple of hours. There’s a dedicated part to hold the famous “Elgin Marbles” that still reside in the British museum. Oh yeah—there’s beer there. Check out our “Beer of the Day” for a few of our favorites, but Athens Beer, 20 Nikis, is a great starting place. 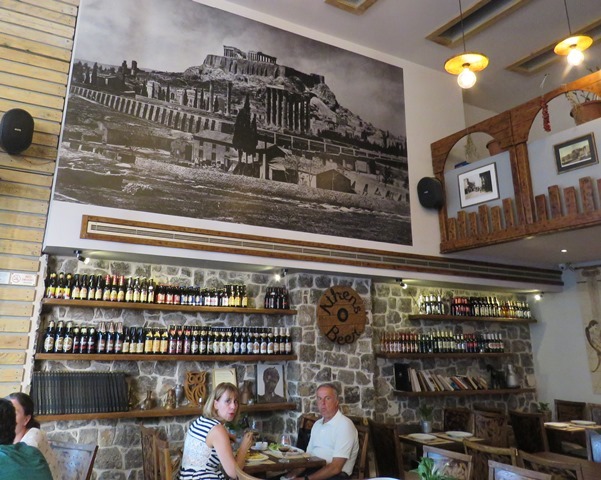 The Parthenon looms over a few of the beers at Athens beer. Just a few minutes from the heart of the Plaka, choose from street-side tables or duck sort-of inside for sort-of cooler temperatures when it’s hot. A wall of beer bottles lets you know from the start you’re not in an ordinary bar. A few of the mane beers at Athens Beer.